Scientists studied the atmospheres of two exoplanets, planets orbiting another star, earlier this year. Both planets are roughly Earth-sized, with atmospheres a bit like the Solar System’s terrestrial planets. As usual, I’ll start by talking about science, faith, and dealing with reality. It’s been decades since an enthusiastic Christian informed me that our sun goes around Earth, not the other way around — because Joshua 10:12–13 says so. He may have been sincere, but I’m quite sure he’s wrong. Oddly enough, I’ve never known a Christian who said that Earth is flat. — despite what Job 9:6–7 says. I could be a Christian, following our Lord, and believe that a solid dome kept the ‘ocean of heaven’ from flooding the earth I walk on. I could even believe that a 17th century Calvinist was right about the universe being created on the nightfall preceding October 23, 4004 BC. But ignoring what we’ve learned in the two dozen or so centuries since Mesopotamian culture provided poets with imagery we read in the Old testament is not vital to Christian belief. This isn’t a particularly new idea. Dominican friar and Catholic bishop Albertus Magnus, born around 1200, is now patron saint of scientists, students, medical technicians, philosophers, and the natural sciences. Catholic bishop and scientist Nicolas Steno helped launch paleontology as a science in 1669. And the Pontifical Academy of Sciences hosted a “Study Week on Astrobiology” in November of 2009. On the other hand, Third Order Dominican Nicolaus Copernicus delayed printing of “De revolutionibus orbium coelestium” until after his death in 1543. Can’t say that I blame him. His newfangled ideas upset some folks who apparently had a shaky grasp of distinctions between poetry and science. European politics since 1517 didn’t help, and that’s another topic. It’s been a year since “Earth 2.0,” Kepler-452b, was in the news. One of the first “Earth 2.0” op-ed pieces I saw was by scientist and former White House Senior Policy Analyst, Jeff Schweitzer. Some Christians apparently agree with Dr. Schweitzer — that Christianity depends on believing one of the Genesis creation narratives is word-for-word true, from the viewpoint of a contemporary Western literalist. I don’t see it that way, but I figure that part of my job is appreciating God’s handiwork: not insisting that ancient Mesopotamians were spot-on accurate. “Two potentially habitable planets in nearby system are confirmed to be rocky. “On May 2, scientists from MIT, the University of Liège, and elsewhere announced they had discovered a planetary system, a mere 40 light years from Earth, that hosts three potentially habitable, Earth-sized worlds. Judging from the size and temperature of the planets, the researchers determined that regions of each planet may be suitable for life. True enough, Earth, Venus, and Mars have atmospheres that stick pretty close to the planet; but those atmospheres are very different. The atmospheres of Venus and Mars are mostly carbon dioxide — but Venus is hot, 740 K/467 °C/872 °F at the surface, with air pressure 93 times Earth’s. Martian surface pressure is only about 6% Earth’s, and cold enough for carbon dioxide frost in winter. Earth’s atmosphere is mostly nitrogen and oxygen, and it’s the only ‘habitable’ planet of the trio. TRAPPIST-1 b and c, the ones studied during this transit, are probably too close to TRAPPIST-1 for life. They’re almost certainly tidally locked to the star, one side in constant sunlight, with years roughly 1.5 and 2.5 Earth days long. That close to TRAPPIST-1, the star’s ‘wind’ probably blew away whatever water they started with. TRAPPIST-1d, orbiting at or just beyond the star’s habitable zone1 may have kept its water, but wasn’t studied this time around. Refined orbital data and calculations, finished only two weeks before the double transit, didn’t give the researchers much time to coordinate with the Hubble team. TRAPPIST-1 is a very small star. Compared to our sun, its mass is about 8%, with a diameter a little more than Jupiter’s: 11.4% of our sun’s. TRAPPIST, the Belgian robotic telescope at ESO’s La Silla Observatory in Chile, is named after Trappists: nuns and monks in the O.C.S.O. — Order of Cistercians of the Strict Observance. The monastic order got its name from La Trappe Abbey, TRAPPIST stands for Transiting Planets and Planetesimals Small Telescope, and TRAPPIST-1 is an ultra-cool dwarf star. “The US space agency has successfully put a new probe in orbit around Jupiter. “The Juno satellite, which left Earth five years ago, had to fire a rocket engine to slow its approach to the planet and get caught by its gravity. “A sequence of tones transmitted from the spacecraft confirmed the braking manoeuvre had gone as planned…. “…Tuesday’s orbit insertion has put Juno in a large ellipse around the planet that takes just over 53 days to complete. Data from Juno’s instruments should tell scientists how much of Jupiter is water, and help them map the planet’s magnetic and gravitational fields. That will help sort out theories of how Jupiter, and the Solar System, formed; and what powers its magnetic field. Another science goal is measuring orbital frame-dragging around Jupiter. Frame-dragging is what happens when moving concentrations of mass-energy drag space-time along with them. It’s also called Lense-Thirring precession, and there will not be a test on this. 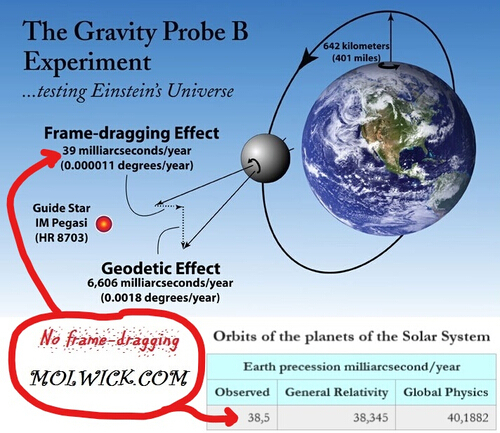 Data from Gravity Probe B, in Earth orbit, confirmed that frame dragging happens — after heavy-duty statistical analysis. The phenomenon should be easier to measure near Jupiter, since the planet has 317.8 times Earth’s mass and spins more than twice as fast. Jupiter’s intense magnetic field is much stronger than Earth’s, trapping and accelerating charged particles, forming a doughnut of radiation like Earth’s Van Allen radiation belt; but a whole lot stronger. Juno‘s path avoids the worst of the radiation, and much of the spacecraft’s sensitive electronics are inside a titanium “radiation vault” with one-centimeter-thick walls. That should keep the spacecraft working for all 37 planned 14-day ‘science’ orbits. Some of the instruments may not last that long. The Jovian Infrared Auroral Mapper (JIRAM) should keep working through at least eight orbits, and Jet Propulsion Lab’s microwave radiometer is good for at 11 orbits. That’s the idea, anyway. After the 37th orbit, Juno is supposed to start a controlled deorbit; a five-and-a-half day maneuver that drops it into Jupiter’s atmosphere — following NASA’s planetary protection policy. Jupiter almost certainly doesn’t support life of our variety, but one of its moons is another matter. One of the simpler explanations for Europa‘s smooth surface is that the Jovian moon has a large ocean under its icy crust. If that’s the case, we might find critters living in that ocean. Meanwhile, NASA wants to be sure than any critters on Jupiter’s moons grew there — and aren’t survivors from a crashed spaceship. And that’s yet another topic. “Nasa’s Kepler telescope has discovered more than 100 Earth-sized planets orbiting alien stars. “It has also detected nine small planets within so-called habitable zones, where conditions are favourable for liquid water – and potentially life. As of this week, we’ve found 3,472 planets orbiting 2,597 other stars; 589 of them have more than one known planet. That’s enough to make some educated guesses about planets we haven’t spotted yet. That seems reasonable, since the Solar System very nearly has two: Earth, and Venus. Granted, Venus is 94.99% Earth’s diameter, and at the inside edge of Sol’s habitable zone. Assuming 200,000,000,000 stars in our galaxy, that gives us 11,000,000,000 ‘habitable’ planets: 40,000,000,000, if we add red dwarf stars to the mix. That’s a lot of planets, and the nearest one may be within 12 light-years of us. Venus, Earth, and Mars, are (barely) in our star’s habitable zone for terrestrial planets. In the outer Solar System life might find a home in or on Ceres, Europea, Enceladus, and Titan. The only place in that list that we know has life is Earth. Venus almost certainly is lifeless, Mars might have enough water left to keep microorganisms going, and the rest — we simply don’t know yet. The rest of the universe may be ‘more of the same,’ or we may learn that life got started on billions of worlds. We may even hit the jackpot, and meet folks who are as chatty as we are. And that’s yet again another topic. 1 A star’s habitable zone, or circumstellar habitable zone, is the volume surrounding a star where a planet like Earth isn’t baked to a crisp, like Mercury, or frozen, like the Solar System’s outer planets. This entry was posted in science news and tagged astronomy, exobiology, exoplanets, planets, science, Solar planets, space exploration. Bookmark the permalink. You could be right about that. Results from the Gravity Probe B mission (starting 2004) were, I understand, very close to the noise level – – – fluctuations which could be accounted for by imperfections in the gyroscopes, and maybe other non-relevant sources. This is one reason for getting data from near Jupiter, where the expected effects should be more obvious. The Wikipedia page on the Gravity Probe B may be of interest to readers. ( https://en.wikipedia.org/wiki/Gravity_Probe_B ) A link to the Wikipedia page on Lense-Thirring precession is in my text under the Juno at Jupiter heading.